Oxford pillowcases, Egyptian cotton and linen. Oxford pillowcases made from Egyptian cotton, standard cotton and pure linen to match your chosen collection. Our Oxford style pillowcases have a decorative 5cm border around each edge, showcasing your bedding. Connie Home takes pride in offering a wide collection of bed linen and this includes our collection of Oxford style pillowcases. These are different to a classic pillowcase because the Oxford version has a 5cm decorative border around each side. This is designed to give your bedroom an elegant and modern appearance. Not only are the pillowcases very comfortable and soft to the touch, but they are also very resistant and do not deteriorate over time. The key to this strength is the use by Connie Home of top quality materials – Egyptian cotton, 100% natural cotton and linen. 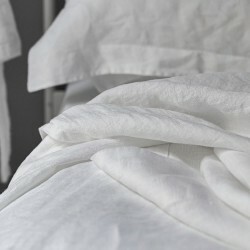 White is the predominant colour used throughout our range of Oxford pillowcases. This natural pure white is the detail that gives your bedroom the luxurious appearance that decoration magazines strive for. Not only does white look great, but it helps you to relax and enjoy a rejuvenating night’s sleep. Throughout the Connie Home range of bedding the Oxford pillowcases are designed to match each Collection. The 5cm decorative border enhanced with either the blue piping of the Harmony pillowcases or an embroidered edging found in the Victoria collection. 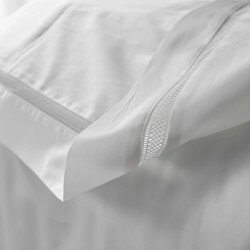 Or the elegant simplicity of the pure white Provence and Lisbon Egyptian cotton Oxford pillowcases. Whichever collection you choose, the textile used is hypoallergenic and made from 100% natural vegetable fibres, this makes them lightweight and ideal for all skin types. When looking for quality Oxford pillowcases at a good price the range offered by Connie Home is hard to ignore with a selection available of Egyptian and natural cotton or linen. All of which give the perfect finish to your bedroom decoration.